Because regular, non-deadly gardens lack a certain sense of adventure, Jane Percy, the Duchess of Northumberland, decided to make the gardens of Alnwick Castle something extra special. When she found herself at the head of the Alnwick household, she also inherited gardens that had long been neglected. Originally thinking that she was going to include a section of plants known for their healing properties, she realized that wasn't as much fun as plants that were poisonous. 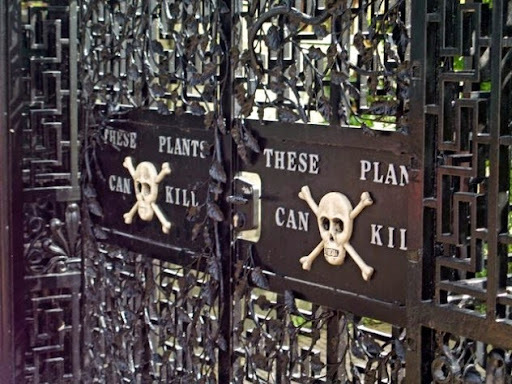 The result is a gated area on the grounds known as The Poison Garden, and it's full of warnings and plants that can cause certain death. Even though visitors are a relatively safe distance from the plants and can't actively smell or touch them, some have fainted from the toxic fumes that are released into the air. While some of the plants have a bizarre, unsettling history-like the angel's trumpet, which acts as an aphrodisiac before its poisonous effects kick in-other plants that the duchess has included in her garden have another meaning. She's included plants like the coca plant and cannabis, seeing the garden as a valuable teaching tool for the schoolchildren that come through. While many of them might be bored by a trip to regular gardens, she sees her poison garden as a great way to get kids intrigued by plants and their properties.